Since my 13-year-old grandson had been promised that we would visit the Disney World and Universal Studios' theme parks in Orlando, Florida this summer . 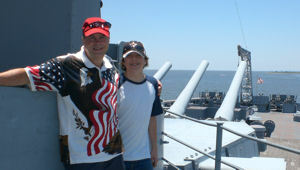 . . it provided an excellent opportunity to arrange historical and informative visits to the USS Alabama battleship, NASA's Space Center Visitor Complex, National Naval Aviation Museum, and New Orleans (since before Katrina). Now, the news about Discovery didn't diminish my grandson's enthusiasm about the rest of the trip either. It just made it more so. Needless to say, I was really looking forward to sharing his infectious glee, as was his mother and grandma. Our first “official” stop on the trip was at the battleship USS Alabama that is moored in Mobile Bay near downtown Mobile, Alabama. 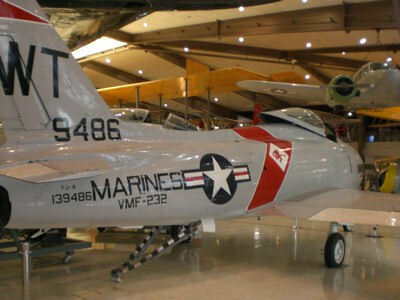 This memorial park also goes beyond the mighty battleship including... the submarine USS Drum; B-52D “Calamity Jane”; A-12 Blackbird Spy plane; Vietnam PBR River Patrol Boat; Tuskegee Airmen's P-51D Mustang; other military bombers and fighter planes; tanks and artillery; and, Vietnam and Korean War Memorials. Depending on one's historical interest (or a child's wanting to see / experience everything) . . . just a leisurely, very informative self-tour of the Alabama can take several hours to most of the day. I just wish we had planned for more time there, as there is so much to take in for so many reasons. Oh yeah, he asked a few questions too! We also had an unexpected, memorable meeting with a World War II hero who survived the Bataan Death March and three years as a POW in the Philippines under the Japanese. 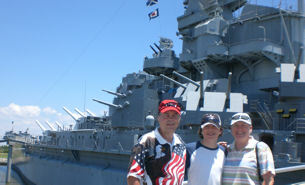 My wife, our 13-year-old grandson, and I were in gift shop to buy tickets to tour the USS Alabama, when we noticed a tall man about my father's age wearing his military medals and ribbons. He had just finished taking a photo with a young boy and then sat down at his table to sign a book for the boy's mother. I have a feeling that most people who vacation in Orlando, FL to experience what Disney World, Universal Studios, and other local attractions have to offer . 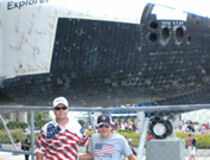 . . never take the 45 to 60 minute drive eastward to visit the Kennedy Space Center Visitor Complex (KSCVC). Well, it should be a vacation must for all doing so . . . as every adult and children even 7 or 8 years old would find it worth every minute of their time. You can spend a full day depending on what you want to experience including... launch pad tours; IMAX films; the many different rockets and space capsules; seeing the insides of a space shuttle; the fallen astronauts memorial, and, having lunch with an astronaut. There are also several options in viewing a space shuttle launch in person, which includes do so very near the launch page by purchasing VIP tickets. However, I understand that it requires ordering these tickets when they immediately become available . 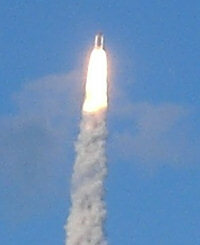 . . especially if it is going to be a weekend launch like Discovery's was on May 31, 2008. Nor does being the founder of USA Patriotism! carry much media influence when all the VIP tickets were sold out and allocated to dignitaries within a short period of time of the first day they became available . . . about two weeks before I finalized the visit to KSCVC. One family from Great Britain that were sitting with us to see the launch about 6 miles away at KSCVC, told us that they were unable to purchase the VIP tickets within minutes of them being available to purchase online at the KSCVC site. Still, we had a great time waiting for about 90 minutes before Discovery's launch, as two astronauts who piloted separate space shuttle missions had a very informative conversation going on that was appreciated by the thousands in attendance under the very hot, almost cloudless sky. Now, I know some might think that the photos here don't adequately illustrate why one should see a shuttle launch in person. Well, being there for possibly a once in a life time experience is reason enough for all who were there! So, I urge you to do so yourself . 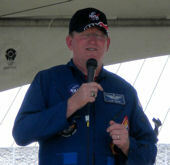 . . as there are only ten space shuttle launches remaining. Driving / Staying Advisory... While I had a parking placard that allowed for parking after the gates closed after 9am on a shuttle launch day, it didn't help in avoiding the nearly three hour return drive to Orlando when leaving KSCVC after the shuttle launch. The fact that the launch was on a Saturday attracted over 150,000 people to view the launch in various areas (some illegally). Just imagine all those vehicles that were heading back to Orlando too with the first 20 or so miles on a two-lane highway. You might want stay in Titusville or nearby on the east coast the night of “a weekend space shuttle launch” and then check in an Orlando hotel the next day. Since you most likely will be visiting Disney World and/or Universal Studios if you are going to experience KSCVC, I strongly urge all adults and families with children who are old enough to understand the importance of culture to take a full day at Disney World's Epcot theme park. Epcot has are many enjoyable attractions and rides, but visiting each country's showcase center should be a must, especially on a first visit. What better way to get a sense of where many American families originated . . . as She is a nation of immigrants. You can even enjoy a respective country's food, knowing that some of the restaurants are relatively expensive and quickly booked. Needless to say, the photo here with my grandson shows our visit to The American Adventure, which remains my favorite on many levels. Inside the showcase you will enjoy a memorable historical experience. And you should definitely arrange your time to enjoy a patriotic sidewalk performance that takes you back to the American Revolution. 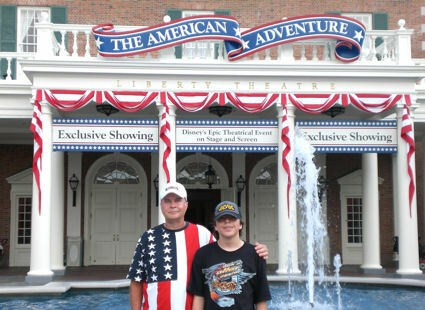 And in front of the American Adventure is where concerts occur at the America Gardens Theatre. 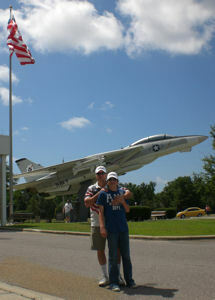 Having my 13 year-old grandson with us reminded me of the first time when we visited the National Naval Aviation Museum the first time with our two sons (11 and 8) and daughter (10). 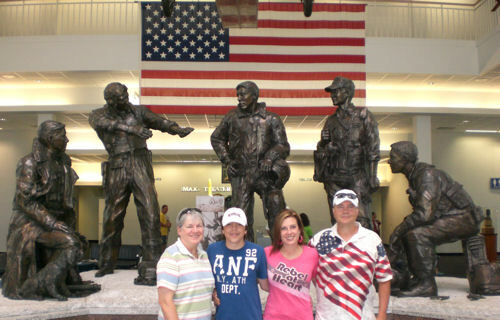 David Bancroft, wife, daughter, and grandson in front of statues of naval aviators from each war And while my daughter liked it then, she enjoyed it much more watching her son having a great time looking at over 150 beautifully restored aircraft representing Navy, Marine Corps, and Coast Guard Aviation along with sitting in the many cockpits including a Blue Angels one. It was the same excitement that my sons exhibited over 20 years ago. 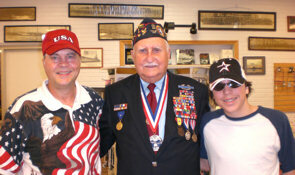 You can also enjoy a group tour given by veterans, IMAX movies, and motion-based flight simulator. Even the drive to it within the Naval Air Station Pensacola offers some interesting views. Since the last time we visited New Orleans was about a month before Hurricane Katrina made its devastating landfall on August 29, 2005 . . . we spent several hours there visiting the river front area and the French Quarter. 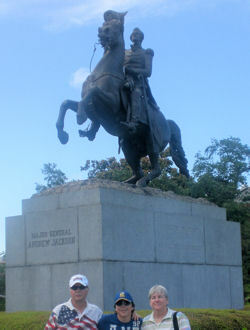 Seeing the statue of General Andrew Jackson (photo right), who became one of America's great Presidents, exemplified to me the character of New Orleans in its ongoing efforts to return fully to the way it was before Katrina's deadly, destructive visit. The same can be said for Mississippi's gulf coast communities that were impacted severely, as well, but with less media attention to given their recovery efforts. And while we can all hope that another Hurricane Katrina event upon the USA shores will never come again, I am sure Americans will respond as they have always done to assist fellow Americans in need. I hope you enjoyed reading about another Experiencing America adventure from me . . . and will experience all or part of it yourself one day (if you haven't already done so).